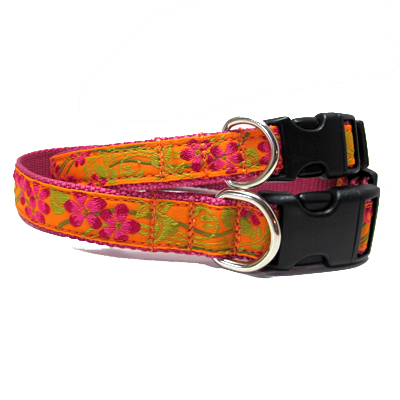 Blossom in pink and orange ribbon is available in 3/4in, 1in width and 1.5in widths. Matching lead is available in 4ft, 5ft and 6ft lengths. Harness sizes Small, Medium and Large available in 3/4in and 1in widths. • Made and shipped from our studio located on Martha's Vineyard.